Thanks fur joining fur us fur Part XI of our Crafting with Cats segment. Mew know we have so much fun making all this stuff, and we hope mew enjoy seeing it and/or making it too! All Crafting with Cats ideas and creations are of our own design. 1. Parsley was snoopervising today's session and making sure all Health & Safety protocols were carried out. 4. Repeat No. 3 then cut out hearts and place right sides together. 5. & 6. 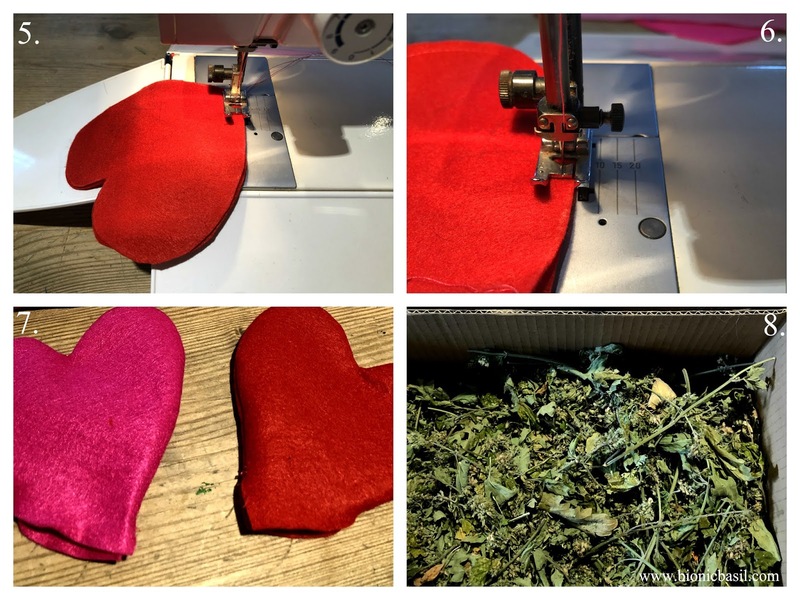 If mew don't have a sewing machine, that's ok. Mew can hand stitch the hearts together. We used the sewing machine and left a good inch so we could turn the right sides out. 7. Turn right sides out and your hearts should look something like this. 8. Get your catnip and stuff to the brim, then hand stitch the last part the of the seams together. 1. Take your chosen fabric, we used this lovely cotton print. 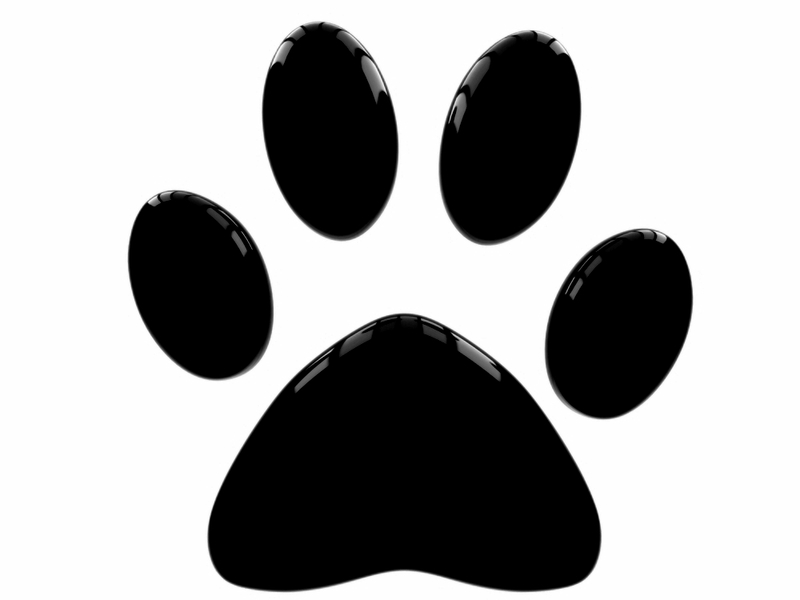 Cut a rectangle, mew can make to a size of your choice, though ours is approx 8 x 4 inches. 2. Fold the rectangle along the long edge [in-half] and sew along the bottom and long edge, either by hand or with a sewing machine. 3. Turn right side out and get your wadding ready. 4. Stuff kicker toy, alternating with wadding and then catnip until full. 5. Cut your ribbon into approx 4 inch lengths and add to top edge, tack in place if mew need to. Stitch securely along the top edge to fully secure ribbons. Even crotchety Amber got stuck in too. In total from start to finish, these 3 toys took about 25 mins to make. It would have been quicker but the P.A. couldn't see to thread the needle - PFFFFTTTT - OLD TIMERS! 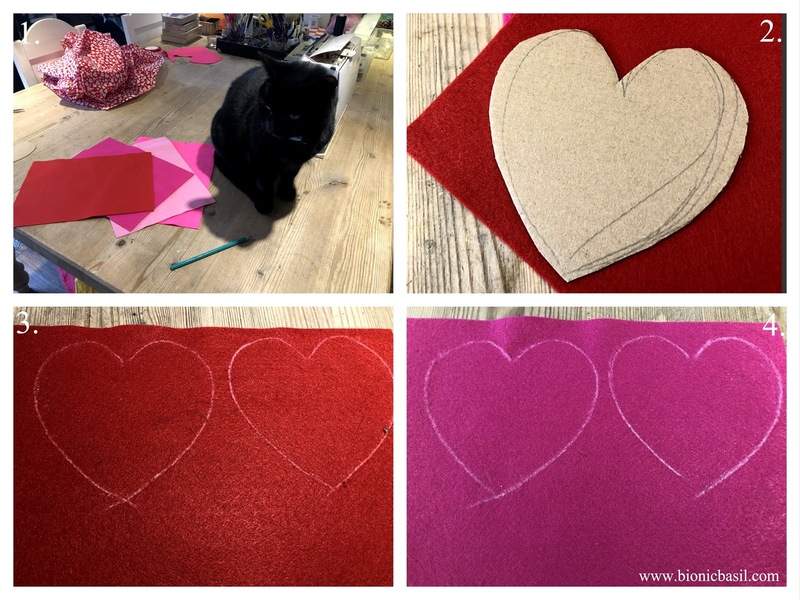 And that furriends furry sadly brings us to the end of our eleventh Crafting with Cats post, we do hope mew liked it and if mew decide to make your furry own Valentines toys, we hope mew enjoy them as much as we are still enjoying ours! Wait till mew see what we've got lined up fur our special Easter crafting sesh, can mew guess? We'll be back tomorrow with The Valentines Pet Parade and do hope mew can join us then. Welcome!! You sure do bear a resemblance to your Angel Basil relation! YOu picked a grat spot to love and be loved..and that heart you are hanging onto says love in big red letters! Those toys look purrty and easy to fabricate. Welcome Melvyn! Just in time to test the craft projects! I do see a family resemblance for sure.....lucky boy. Love the projects too - easy to do (even if you don't have a sewing machine!) 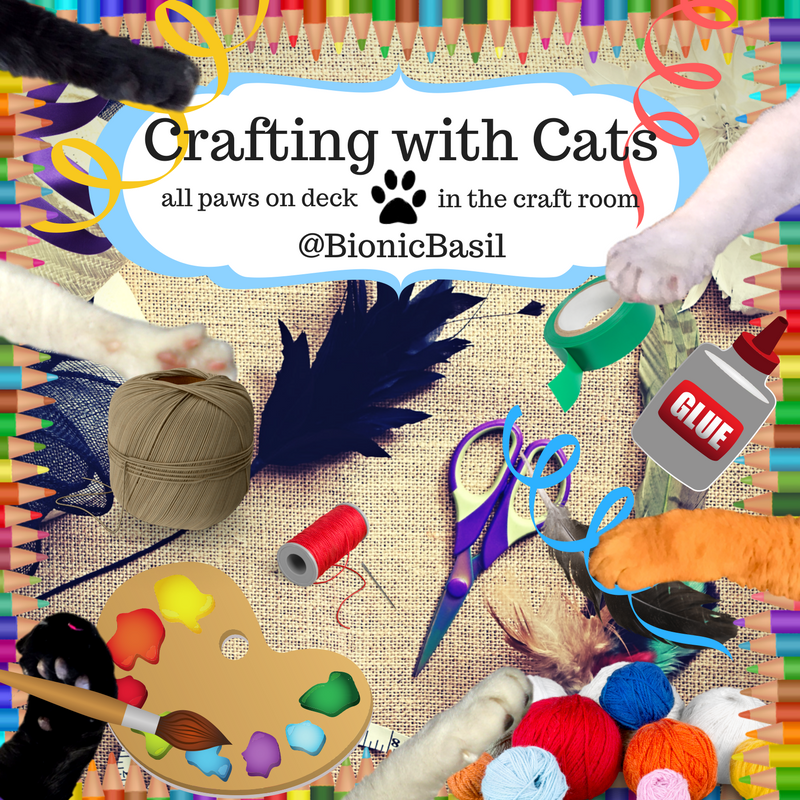 and maybe I can get my Mom interested in whipping up a little something for yours truly in honor of the DAY OF LOVE (and catnip)! Hello Melvyn! It's lovely to meet you, and I do see a very strong family resemblance. Are you going to tell us your story? Those toys look good, especially stuffed full of nip. I think I might make some for the shelter, not Valentine's ones though because I wouldn't get them done that quickly. Such fun crafts and a fun Melvyn too, welcome to you Melvyn!!! Howdy, Melvin! Do you know what kind of outfit you are now a part of? Aw, welcome to the clan Melvyn. You're a handsome one. I love all the Valentines crafts. Happy colors. Wow! 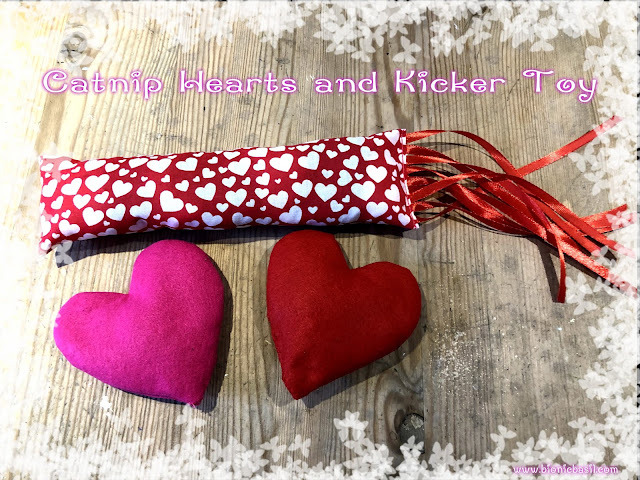 What fun Valentine toys! And Melvin sure is putting them to the test. Nice to meet you, Melvin! Welcome Melvyn! You are one lucky kitty to have landed at Bionic Basil HQ. Hi Melvyn!!!! Great to see you have joined the B Team. Me thinks you'll have LOTs of wild adventures and soooo much fun they will be writing books about you too, just like your uncle B. What kitty doesn't luv a good kicker toy, right? 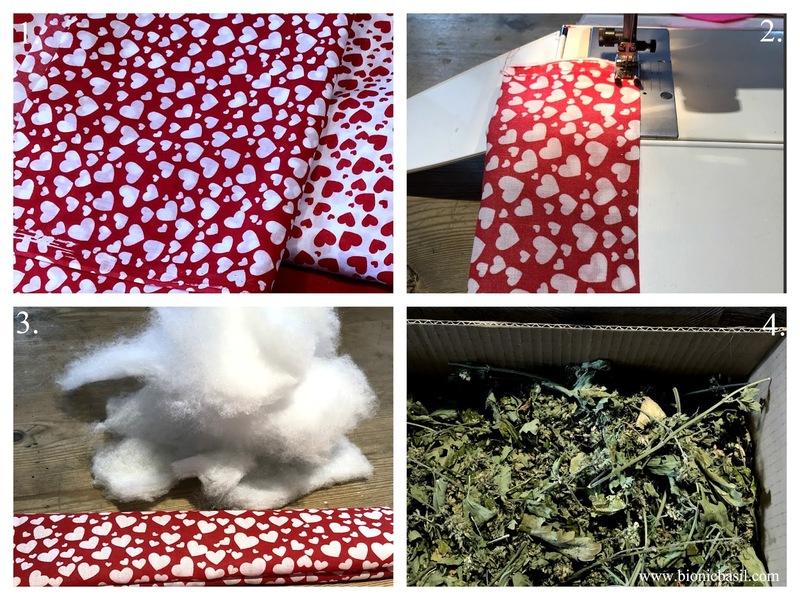 Yours look fun to make and I'm all for anything with hearts printed on them! Mom luvs to craft, but she has more ideas than time! Tee hee hee. Hugs.